So it's a week later and we're on lesson 2 of our 3 day crewing course. The weather cleared up again today, making for some great conditions for learning some of the finer points of docking, points of sail and basic navigation. We repeated our breakfast at Kitty's and met Katy at the entrance to the marina. I sort of took my time locking up the van and when I looked up my friends were half way down to meet her. 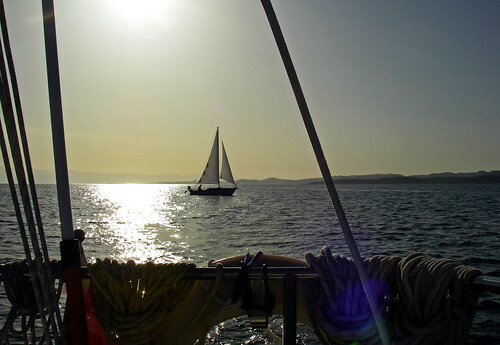 Katy had been out on a few challenging days in the week including an almost day long sail from Oak Bay to West Bay thanks to fierce headwinds on Friday. We all hopped aboard a much more familiar Rose of York and set down to do our tide, weather and current predictions. 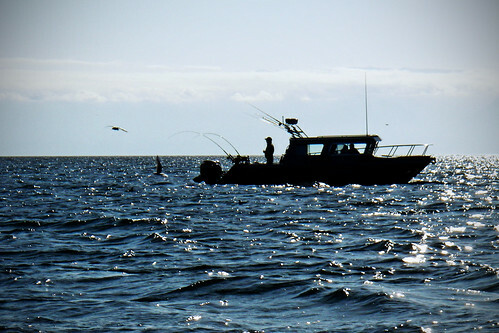 The old current atlas came out so everyone could have a peek at the wild patterns of current around the Juan de Fuca and Haro straits. We logged it all - man how this feels just like getting ready for a day of kayaking. If you missed them before, I did a few tide and current table templates a while back that I still like to fill in for unfamiliar trips more than about 10km. We got the boat setup and then the skipper showed us some of the finer points of reefing a main sail. 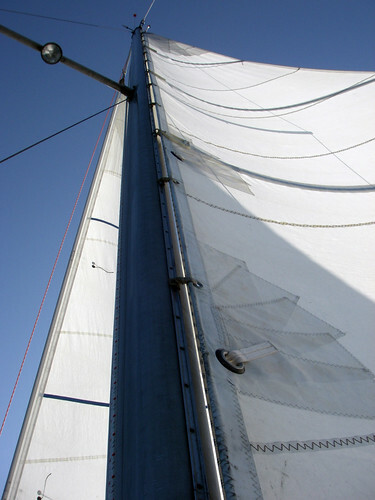 The airs were nice and light and we were head to them, so we decided to raise sail in the slip and give reefing a try. The reefed nicely and we got some key ideas of what lines need to be eased and hardened. We shook out the reef and then put away the main sail. We started the motor and Kevin took the helm while Jordan and I cast off. It was time to do some docking exercises. So this was the part I absolutely dreaded. We each got about 3-4 solid tries at it in a nice wide slip. Kevin was first to go and did great, I held the stern line and basically just watched the technique. Jordan took the helm and I hopped up to do the bow line. Jordan also got it nice and quick. Just to make it a little more fun, we all got to test 3 point turns, too. So it was my turn and much to my chagrin, both the wind and the currents under the dock had been slowly increasing. But I found out there's nothing to worry about if you just keep in mind where you're aiming the pointy bit up front. 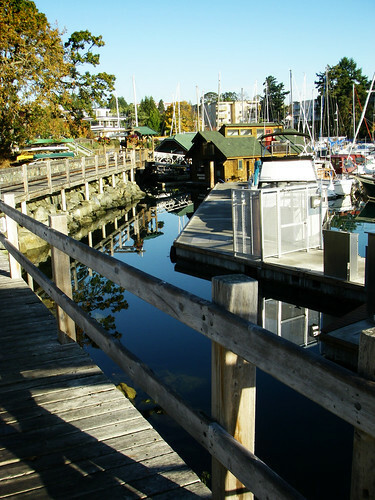 A good cue for me was the rear cleat on the dock. Aiming for that and keeping just enough speed for steerage meant everything would be alright. After those little exercises, I had a good feel for the tiller save the little accidental, "no, not that way, stupid brain," moment. 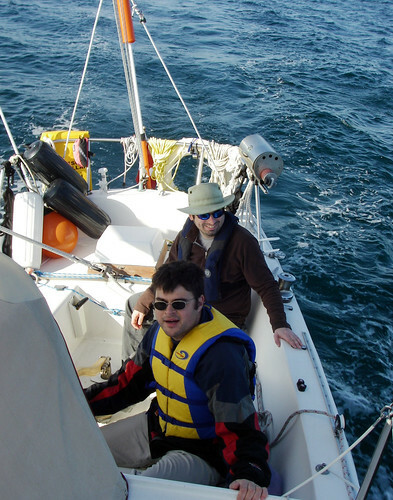 I stayed on the helm and motored us out into the wind and waves. We stopped just outside the V21 buoy and raised the sails. The wind was nice and brisk this morning and the boat absolutely loved it. I called a (sta-)port tack and we steered to course and started trimming in the sails. We cruised for a ways and then did a few quick tacks for each of us, just to get the muscle memory down. by the end of that we were swinging around the cockpit much faster that the previous week. We were on a close reach for a bit and were getting some good speed from the boat, but as we pressed forward, we were being a bit over-driven. The boat heeled over nicely and we started to see why the crew sit on the edge of the sailboats from time to time. So The skipper decided to demonstrate heaving to to get us totally stopped in order to trim the mainsail. It's a much quicker procedure than I thought it would be. We went into the heave to. We got super close hauled and the boat started to turn a bit, then we tacked without adjusting the headsail and the boom swung across. We eased the heck out of the main sheet and with some nice merciless tiller work and we were stopped. Our skipper lashed the tiller and Kevin and I hopped up behind the boom to lower the mainsail. we lowered the sail, put the reef in and hauled it back up. Man talk about work! 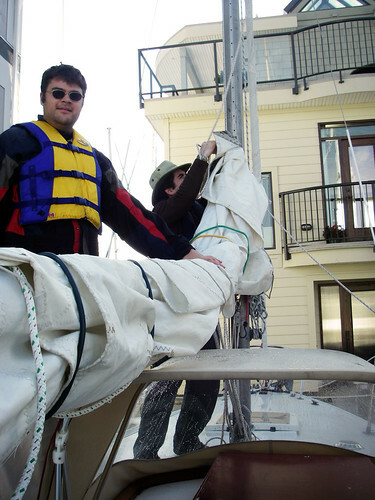 Raising a mainsail while full of wind took all my body weight and Kevin locking the tail to the cleat every time. We got it all back up, adjusted our downhaul and boomvang and we realized... we're still stopped. We got out of it by just by bringing the main sail back to close hauled and moving the tiller slowly back to the centerline. The boat crept around slowly and we trimmed the sails just right. Suddenly, POW - the power came back into the sails and we were off again. We were still heeling a bit so we went through the rather quick task of furling back a bit of our headsail and we got the boat on a nice even keel in a beam reach. The power was great and we just sat on the course for a while. We had a look at the chart and found we were hurtling into a traffic lane. No sooner did we recognize that, two large container ships appeared from the mist heading toward trial island. We altered course and headed back along the path we came to keep out of their way. We had a quick break while the boat was being nicely behaved and one little reality was hitting us, the wind was subsiding. 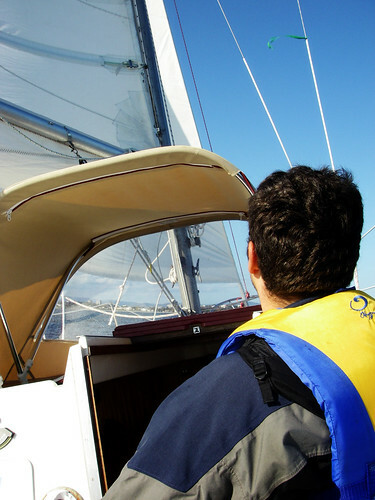 We set a course for clover point and had a little go on a broad reach. We cruised there for a while and the speed was just getting lower and lower. Jordan unfurled the headsail and we got hove to again to go shake out the reef for the rest of our downwind journey. From this point on, the skipper let us try and come up with a nice path home. 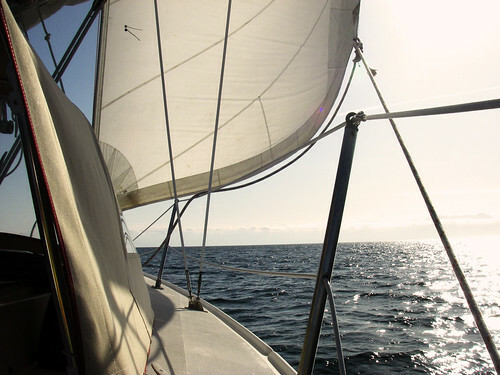 It totally hit home exactly how the sails could help steer the boat and what we'd have to do to go where we wanted. I sighted the Brotchie ledge light and suggested we keep to starboard of it. We adjusted the sails for the helm's new course and sat back and saw the magic in action. The winds were getting lighter on our run. It's a tough job keeping the run going, so Katy showed us a neat idea called a preventer, a rope tied from the trailing edge of the boom to the forward cleat that prevents and accidental jibe if the wind veers or backs or the helm falls asleep. As we got around Brotchie ledge, we decided to remove the preventer and get into a close reach to get closer to Mcauley point. 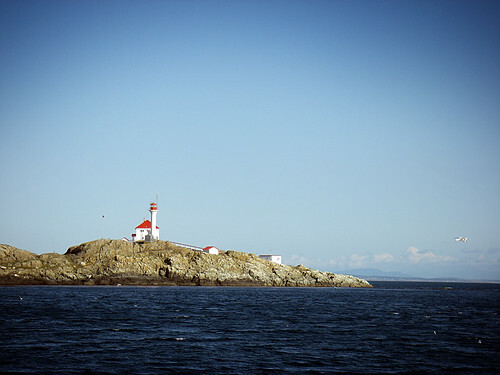 The boat behaved just as expected and we kept a nice even course toward Esquimalt harbour. We were being followed by another sailboat on the same tack and he was windward. We had to tack, so we just waited for enough sea-room for us to execute the tack. We sailed only a little way after the tack and lowered the sails. I motored us back to the marina and managed to get us back to the slip in one piece. 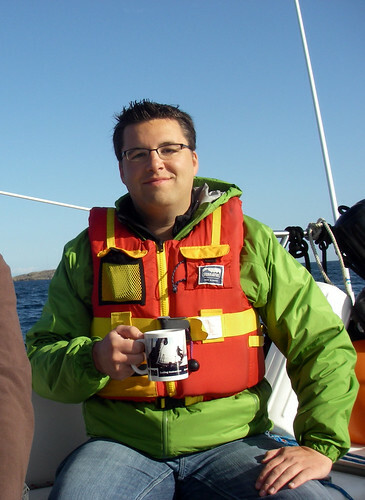 I am much happier about motoring and docking now and sailing's starting to feel strangely familiar. We got the boat all cleaned up and found ourselves totally giddy about the great day on the water and the unusual October weather.